It took more than a year of waiting to photograph Jess and Matt's big day and in particular their reception at The Tea Room in Sydney's iconic Queen Victoria Building. During that time I had been so excited about the prospect of running riot in this glorious space that I performed more location scouting missions than I can remember. But finding locations is the easy bit - there are loads of great spots where a couple can be captured amidst the beautiful architecture; the trick is keeping your bearings and learning how to efficiently navigate the kaleidoscopic mix of escalators, staircases, columns, glass and tiles across the three main floors. When the day finally came round we had around half an hour to use the QVB before the bridal party made their entrance. My prep kicked in and I guided Jess and Matt around on my personalised photo tour. Most of the images we made faithfully captured our elegant and historic environment but we also wanted to create something a bit quirkier. 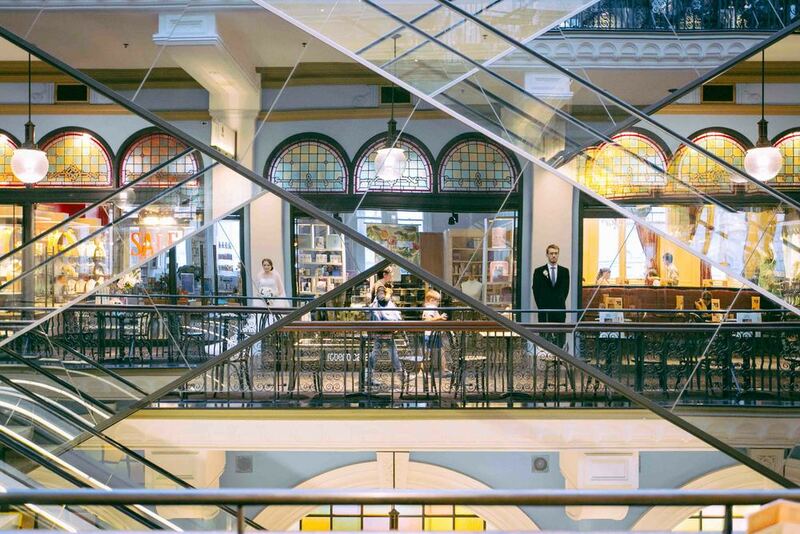 So here we have an image that combines various aspects of the QVB: the arched glass windows of a Victorian arcade; the strong lines of the modern escalators; and the rumours of ghosts.